In the recent press meet held on 3rd of Feb 2018, Seruds President Sri. Mallikarjuna officially announced about the Tennis Competition that is going to be held by Seruds Ngo from 10th to 16th Feb for under 14 and Under 18 category boys and girls. Around 168 people from the states of Telangana, AP, Tamil Nadu, Madhya Pradesh, Karnataka, Delhi, Chhattisgarh, and Maharashtra are expected to participate. 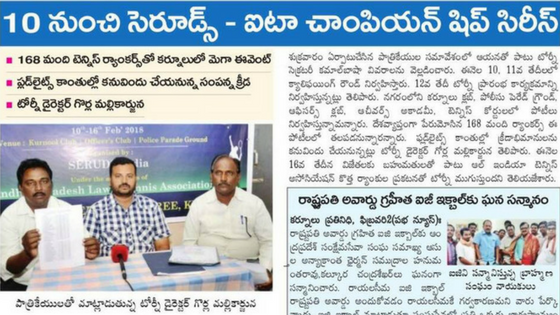 The competition organizer Mr. Kamal Basha told, “All the necessary arrangements have been made for the competition of Tennis Matches in Kurnool”. All the major media in Kurnool has covered the news segment which can be seen on the official Facebook page of Seruds. Seruds President said, ‘Let’s make it a grand success’ and appealed for everyone’s participation. Qualifying matches are to be held on the dates of 10th and 11th Of Feb, main matches on 12th and competitions are going to end on the date of 16th. Prize distribution will be on the final day i.e. on 16th and ends with the announcement of All India Tennis Association Ranks.